Their basic formula for selling different jewelry and merchandise is that, they hire professional photographers to take appealing photographs of the jewelry. 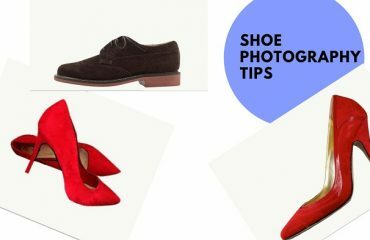 Then they edit those images using professional graphic designers or they outsource the work from the best Photo Retouching Services like Clipping Path Experts. Jewelry is a delicate type of product which needs to be polished and cleanly retouched in order to grab customer’s attention. 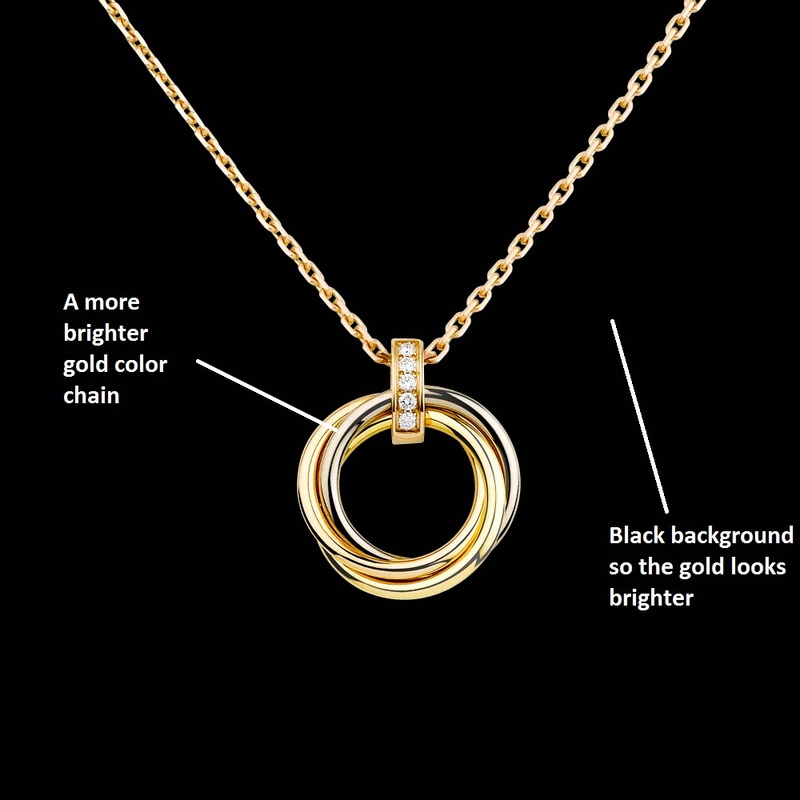 A jewelry image has lots of curves and loops which need to be properly retouched using Photoshop. This will enhance the jewelry image. 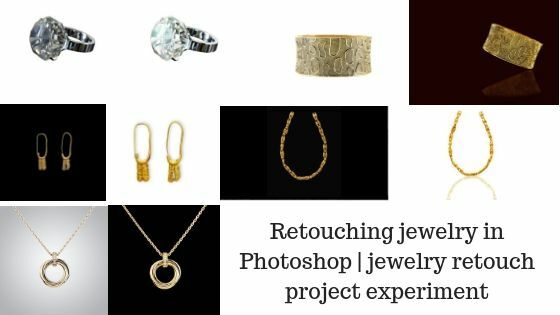 As a photo editing company we also get various types of jewelry retouching projects almost every day. Sometimes the customers love our edits and sometimes they make some changes in the edits. The reason they do it is because they want to grow their conversions. They experiment using the jewelry images. We also did some special jewelry retouch project so far. 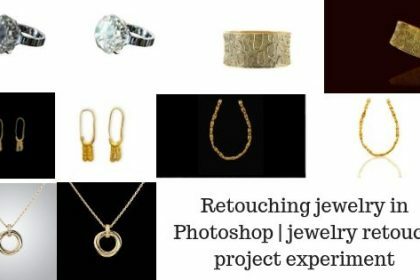 In this article we’ll show you how to enhance jewelry in Photoshop and how were our jewelry retouch project experiments. So, without further adieu let’s start! Ring was one of our smoothest retouching project so far. Here our client had asked for only one thing, which was to highlight and increase the brightness of the stone because their customers liked such pictures where the stone looked glossy. We had used the color correction method by applying adjustment layers such as the brightness and contrast adjustment layers on the stone. 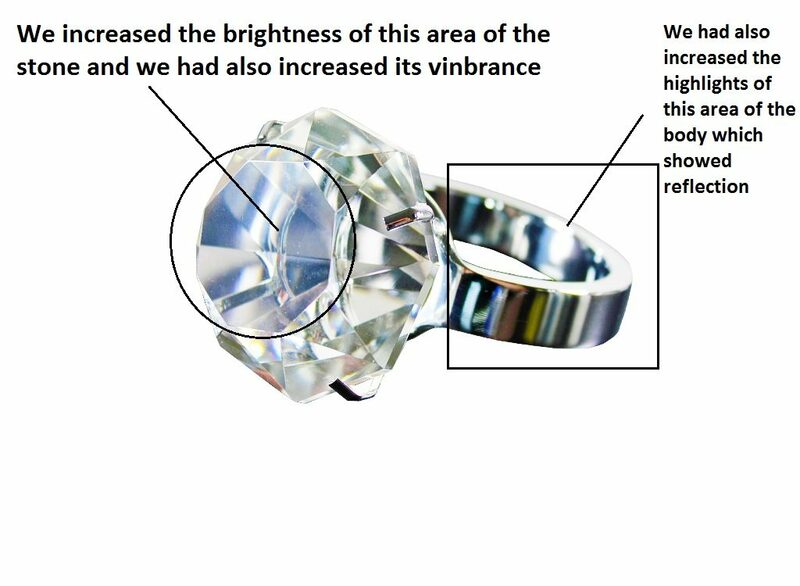 We had also clipped the other parts of the ring like the body of it and then we retouched them according to the color of the ring. They had sent us this image of the ring for image correction. They wanted us to highlight the body of the ring as well as the stone because, their customers used to like this type of retouching at first. Here is the project work we had sent them the first time. 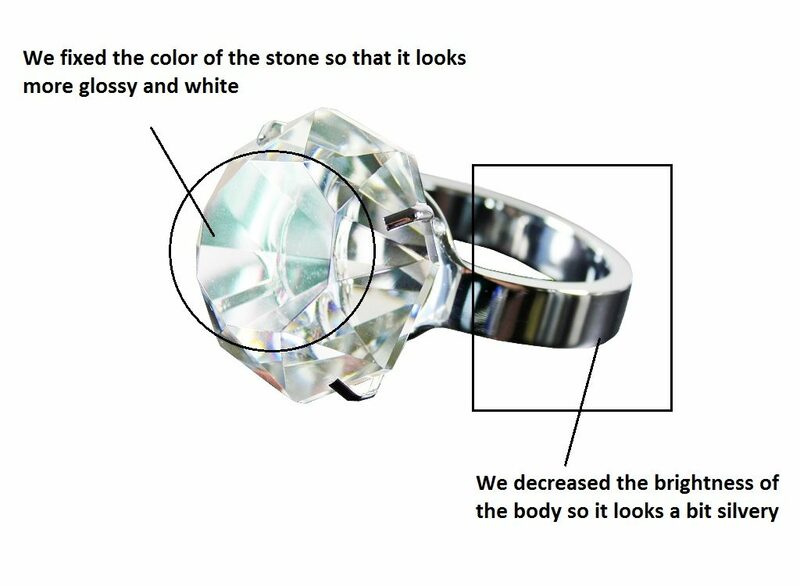 We had increased the brightness of the stone and body of the ring while we edit jewelry in Photoshop. But, suddenly the taste of their customer changed and they started liking more glossy stones and they also liked to see the exact color of the body which was deep silver but not bright. 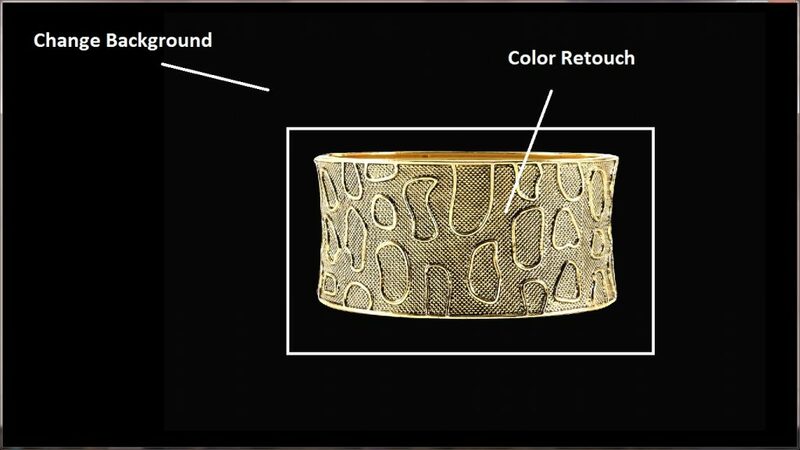 So, the client sends us this image again to fix the color and retouch the ring once more. Here, we fixed the color of the stone using Photoshop and then decreased the exposure of the body to make it look more original and silvery. 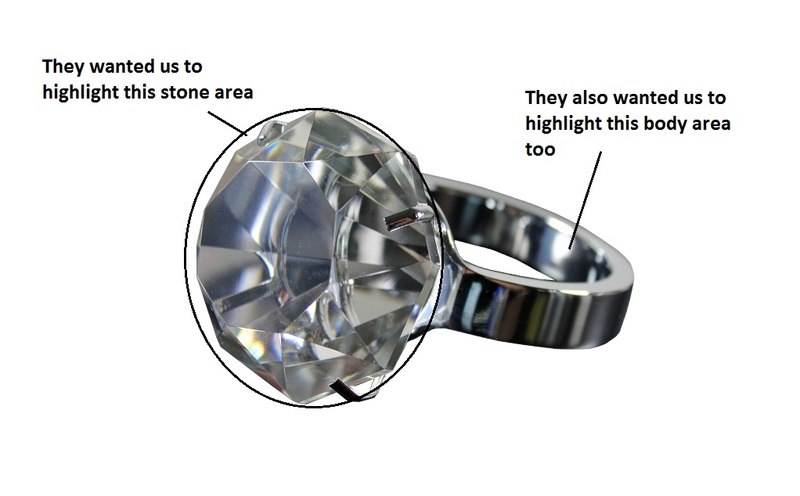 This is how we managed to run an experiment about jewelry retouching using the adjustment layers and customer behavior. Our clients loved our work and still send us their images for post processing. 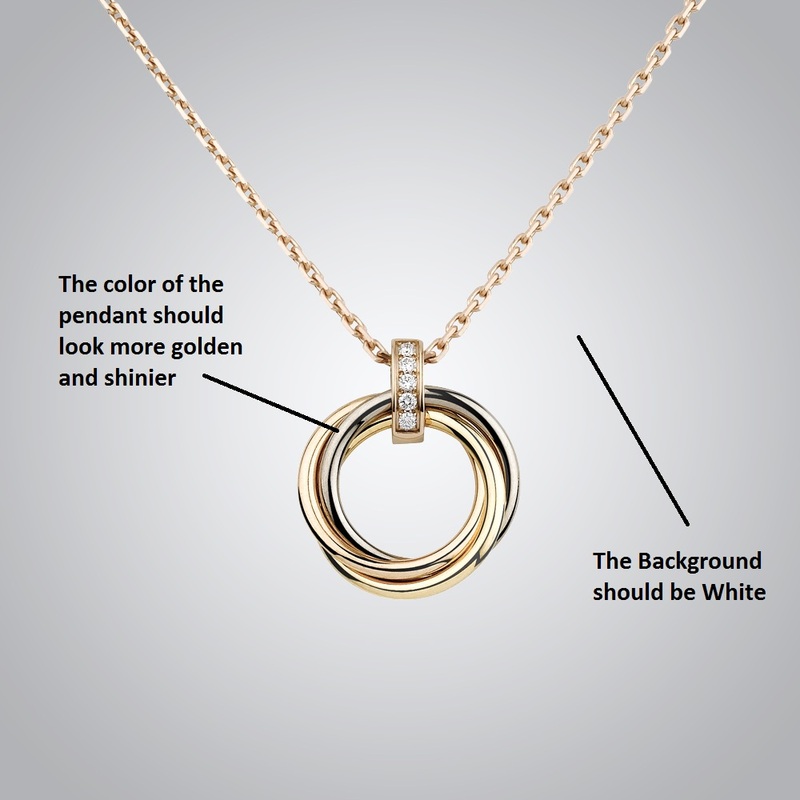 Another project experiment we had come across was the pendant retouching project. The client here gave us an image of a pendant which was gold plated. He told us that the customers he had usually liked images which showed the gold color look more golden and shiny but they wanted a white background with it. 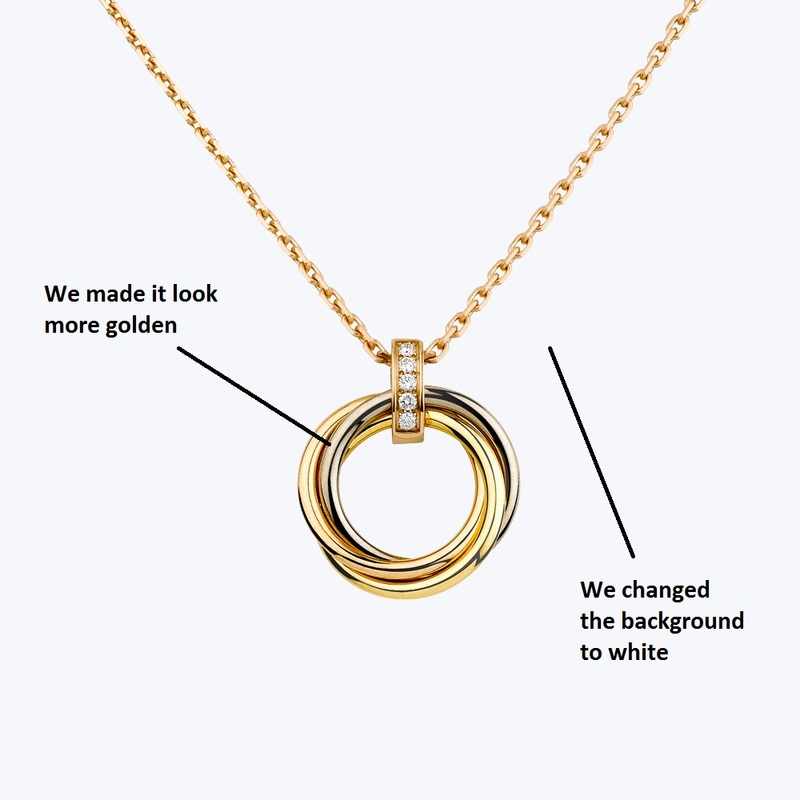 So we retouched the project by removing its background to white and using color correction we fixed the gold color of the pendant and gave it a shinier golden look. After changing the background to white using clipping path and fixing the color of it using the color balance adjustment layer we gave them this image. Then they used this image to attract new customers but soon they noticed that their competitors sold more pendants and their images had a black background. 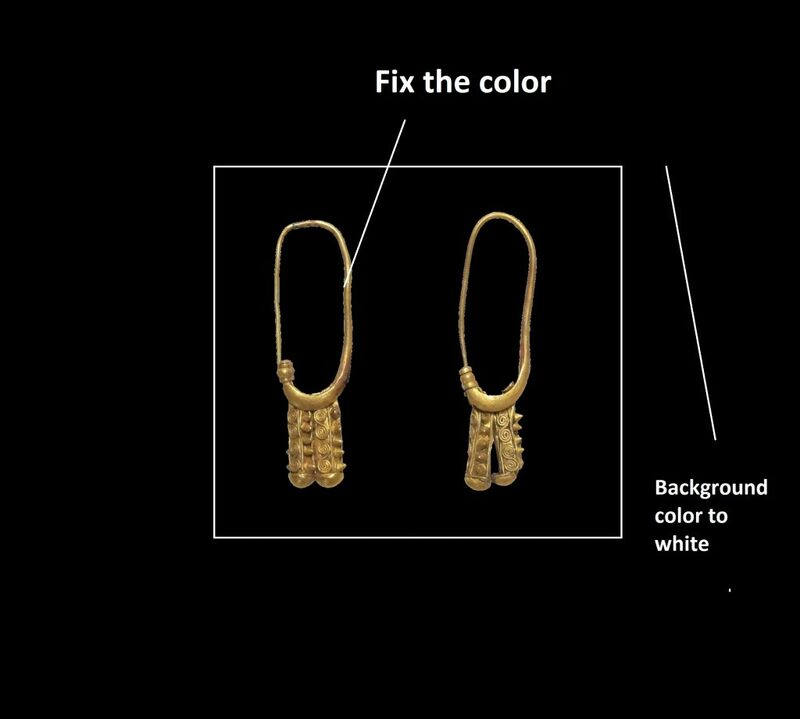 So they understood that a color like gold looks better in a black background and their pendants would had better conversion if the background was black the gold color looked a bit shinier. 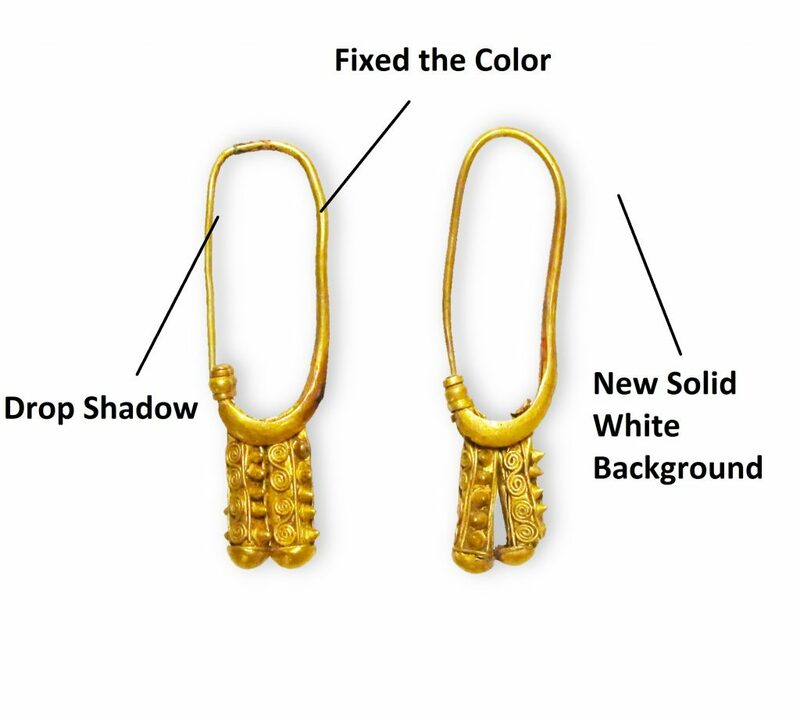 So, we again used clipping path to change the background to white and we did correction of the gold color using retouching technique. One of our toughest projects was when a client sent us the photo of an ear ring which had a black background but the color was completely dull gold. He wanted us to edit them in such a way that it looks eye catching and attractive. At first we were having problem with the color correction of it. Then we got an idea so we did an experiment with it. We changed the background of that photo to white and then retouched its color and brightened it up then we added a small drop shadow to it and then we sent it to our clients. Here is the image we send him and luckily this time our experiment was successful and when we send him our work he loved it. This was what we did to the ear ring image after retouching it. We also did some experiments with the jewelry called chain. 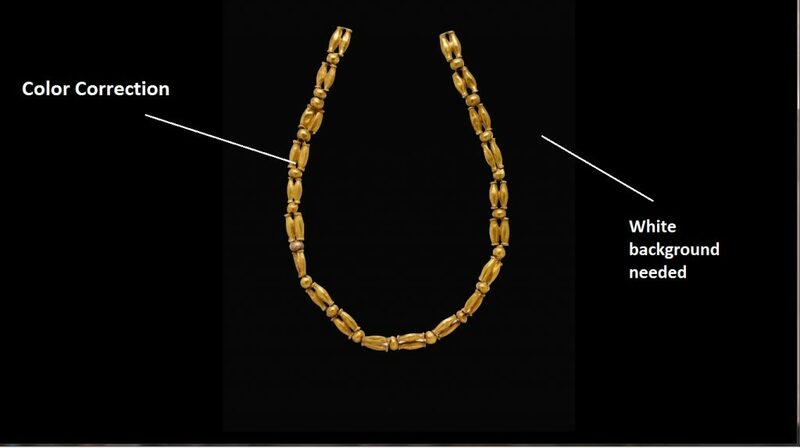 Chain is the most common jewelry that almost every gender wears. So, there is a huge demand of it in the market. 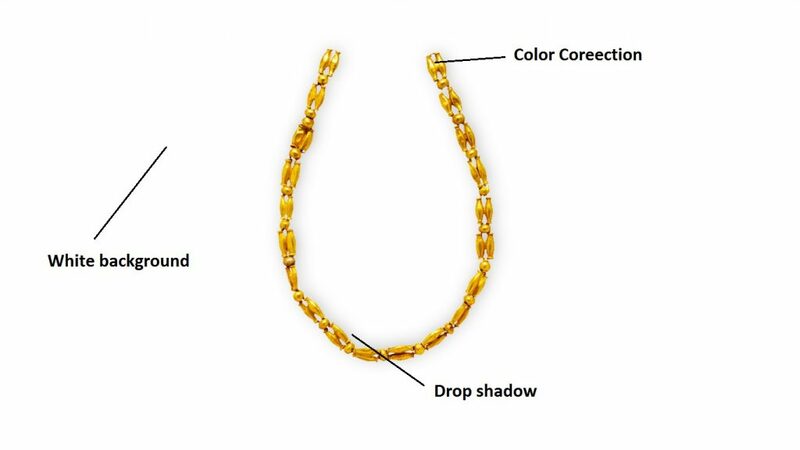 One of our clients sent us a chain image where he wanted it to look more bright and vibrant. But he wasn’t sure that a drop shadow on it would also suit it or not. He also wanted the background to be white. So we did an experiment for him and we send him the chain photo with color retouching and drop shadow effect. But he wasn’t satisfied with this image; he thought that adding some reflection to it may make it look a bit more attractive. 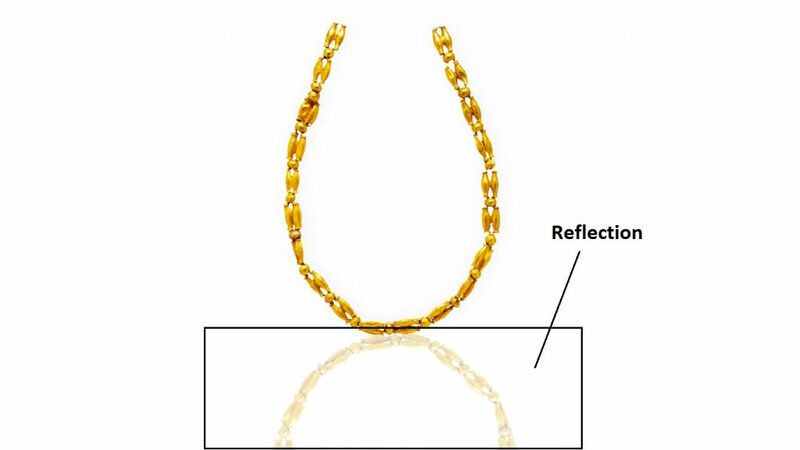 Then we used Photoshop to create a reflection of the chain and made it look completely unique and attractive. The only jewelry project regarding which we never had done any experiment of was, a Bracelet. 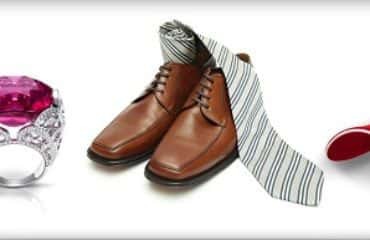 But recently we had to run an experiment with it too because our client told us that the market he was doing business in has a habit of changing tastes about fashion. They love his jewelries but the picture wasn’t that much appealing so he wanted to replace the background and retouch the jewelry a little bit more. So, we experimented by replacing the background a more dark and silky texture so that it goes with the bracelet and we adjusted the color of and retouched it a little bit so that it looks elegant. And it was another successful experiment because his revenues increased about 35% from before after the change in the image. 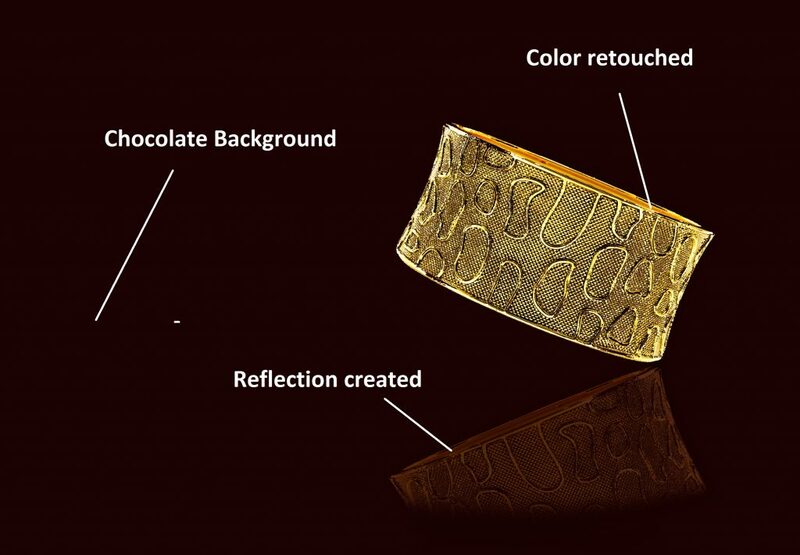 We had created a reflection to the jewelry and had increased its vibrancy using adjustment layers. We also changed its background to a more deep chocolaty background which looks elegant with gold. Every perfect jewelry image becomes perfect after getting processed and we have always focused on giving our clients the best picture that always will increase their revenues. 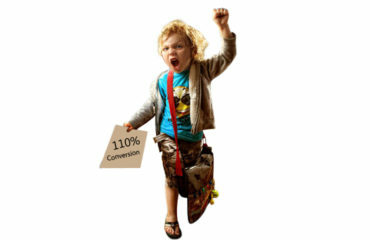 In these above projects we have clearly described the reasons that has helped them increase conversions and what experiments we did with the jewelries. Therefore, Photoshop actually helps a company to generate revenue using the image retouching method.